The Batasang Pambansa in Quezon City is the current base of the House of Representatives. According to the 1987 Constitution, legislative power shall be vested in the Congress of the Philippines, which shall consist of a Senate and a House of Representatives. The Senate shall be composed of twenty-four Senators who shall be elected at large by the qualified voters of the Philippines, as may be provided by law; the House of Representatives shall be composed of not more than 250 (unless otherwise fixed by law), 20 percent of whom must be Party-list representatives. a resident of the Philippines for not less than two years before election day. except the party-list representatives, a registered voter and a resident for at least one year in the district where s/he shall be elected. Congress is responsible for making enabling laws to make sure the spirit of the constitution is upheld in the country and, at times, amend or change the constitution itself. In order to craft laws, the legislative body comes out with two main documents: bills and resolutions. joint resolutions — require the approval of both chambers of Congress and the signature of the President, and have the force and effect of a law if approved. concurrent resolutions — used for matters affecting the operations of both chambers of Congress and must be approved in the same form by both houses, but are not transmitted to the President for his signature and therefore have no force and effect of a law. simple resolutions — deal with matters entirely within the prerogative of one chamber of Congress, are not referred to the President for his signature, and therefore have no force and effect of a law. Bills are laws in the making. They pass into law when they are approved by both houses and the President of the Philippines. A bill may be vetoed by the President, but the House of Representatives may overturn a presidential veto by garnering a 2/3rds vote. If the President does not act on a proposed law submitted by Congress, it will lapse into law after 30 days of receipt. Jurisdiction: All matters relating to malfeasance, misfeasance and nonfeasance by officers and employees of the government; implementation of the constitutional provision on nepotism; and investigation of any matter of public interest on its own initiative or brought to its attention by any member of the Senate. Jurisdiction: All matters relating to the auditing and adjustment of all accounts chargeable against the funds for the expenses and activities of the Senate. Jurisdiction: All matters relating to agrarian reform, landed estates, and implementation of the agrarian land reform provisions of the Constitution. Jurisdiction: All matters relating to agriculture, food-production and agri-business, such as agricultural experimental stations, soil survey and conservation, animal husbandry, and fisheries and aquatic resources. Jurisdiction: All matters relating to banks, financial institutions, government and private currencies, capital markets, mutual funds, securitization, coinage and circulation of money. Jurisdiction: All matters relating to the civil service and the status of officers and employees of the government including their compensation privileges, benefits, and collective negotiation agreements; reorganization of the government or any of its branches; and all other matters relating to the bureaucracy. Jurisdiction: All matters relating to policies, programs, strategies, technologies and other innovations addressing global warming and climate change impacts. Jurisdiction: All matters proposing amendments to the constitution of the Philippines, and the revision of existing codes. Jurisdiction: All matters relating to cooperatives, including farm credit and farm security, cooperative movements, and the implementation of the Cooperative Code of the Philippines. Jurisdiction: All matters relating to cultural communities. Jurisdiction: All matters relating to economic planning and programming, general economic development, and coordination, regulation and diversification of industry and investments. Jurisdiction: All matters relating to education, schools, colleges, and universities; the implementation of the constitution provision for a free public elementary and secondary education; non-formal, informal and indigenous learning systems, and adult education; the preservation, enrichment and evolution of Filipino arts and culture; and the establishment and maintenance of libraries, museums, shrines, monuments, and other historical sites and edifices. Jurisdiction: All matters pertaining to election laws and to the implementation of the constitutional provisions on initiative and referendum on legislative acts, recall of elective officials, the role and rights of people’s organizations, and sectoral or party list representation. Jurisdiction: All matters relating to the exploration, exploitation, development, extraction, importation, refining, transport, distribution, marketing, conservation, or storage of all forms of energy; renewable and potential forms of energy resources; and generation, transmission and distribution of electric power. Jurisdiction: All matters relating to the conservation and protection of the environment, and all matters relating to the management, development, protection, exploration and utilization of the country’s national reserves such as forest and mineral resources. Jurisdiction: All matters relating to the conduct, rights, privileges, safety, dignity, integrity, and reputation of the Senate and its members. Jurisdiction: All matters relating to funds for the expenditures of the national government and for the payment of public indebtedness; auditing of accounts and expenditures of the national government; intergovernmental revenue sharing; and, in general, all matters relating to public expenditures. Jurisdiction: All matters relating to the relations of the Philippines with other nations; diplomatic and consular service; the United Nations (UN) and its agencies, the Association of Southeast Asian Nations (ASEAN), and other multilateral organizations; all international agreements, obligations and contracts; and overseas Filipinos. Jurisdiction: All matters relating to games and amusement such as lotteries, horse-racing, boxing, and basketball, and matters related to amateur grassroots and elite sports development. Jurisdiction: All matters affecting government corporations, including all amendments to their charters, the interests of the government industrial and commercial enterprises, and privatization. Jurisdiction: All matters relating to public health, medical, hospital and quarantine services, and population issues, concerns, policies and programs affecting individuals and their families. Jurisdiction: All matters relating to the organization and administration of justice, civil courts, and penitentiaries; impeachment proceedings against constitutional officers and other officers; registration of land titles; immigration and naturalization; the implementation of the constitutional provisions on human rights; and all matters pertaining to the efficiency and reforms in the prosecution service. Jurisdiction: All matters relating to labor employment and human resource development; labor education and standards; recruitment, training and placement of workers and exports of human resources; and promotion and development of workers’ organizations. Chairperson: Sen. Ferdinand Marcos Jr. Jurisdiction: All matters relating to autonomous regions, provinces, cities, special metropolitan political subdivisions, municipalities, and barangays. Jurisdiction: All matters relating to national defense, and external and internal threats to national security; the Armed Forces of the Philippines (AFP); war veterans and military retirees; civil defense; and military research and development. Jurisdiction: All matters relating to peace, armed conflict resolution, political negotiation, cessation of hostilities, amnesty, integration and development of former rebels, and national unification and reconciliation. Jurisdiction: All matters relating to public information, mass communication and broadcast services, the implementation of the constitutional provisions regarding ownership of mass media and the advertising industry, and the artistic standards and quality of the motion picture and television industry. Jurisdiction: All matters relating to peace and order, the Philippine National Police (PNP), the Bureau of Jail Management and Penology (BJMP), the Bureau of Fire Protection (BFP), and private security agencies; the possession, use, cultivation, manufacture, distribution and sale of prohibited and regulated drugs, the prosecution of offenders, and rehabilitation of drug users and dependents. Chairperson: Sen. Ramon Revilla Jr. Jurisdiction: All matters affecting public services and utilities, communications, land, air, river and sea transportation including railroads, inter-island navigation and lighthouses, and the grant or amendment of legislative franchises. Jurisdiction: All matters relating to planning, construction, maintenance, improvement and repair of public buildings, highways, bridges, roads, ports, airports, harbors and parks, drainage and flood control, and irrigation and water utilities. Jurisdiction: All matters affecting the rules of the Senate, the calendar and parliamentary rules, the order and manner of transacting business, and the creation of committees. Jurisdiction: All matters relating to science and technology, including scientific and technological research, development and advancement. Jurisdiction: All matters relating to rural development and welfare, and the implementation of the constitution provisions on social justice. Jurisdiction: All matters relating to tourism and the tourist industry. Jurisdiction: All matters relating to domestic and foreign trade and private corporations; micro, small and medium enterprises (MSMEs); social enterprises; the promotion of entrepreneurship and the regulation of entrepreneurial practice; patents, copyrights, trade names and trademarks; quality control; control and stabilization of prices of commodities; consumer protection; and handicraft and cottage industries. Jurisdiction: All matters relating to urban land reform planning, housing, resettlement, and urban community development. Jurisdiction: All matters relating to revenue-generation, taxes and fees, tariffs, loans, and other sources and forms of revenue. Jurisdiction: All matters relating to the women, family relations, and equality before the law of women and men. Jurisdiction: All matters related to the youth and its vital role in nation-building, promotion and protection of their physical, moral, spiritual, intellectual and social well-being, and their involvement in public and civic affairs. Jurisdiction: All matters relating to the internal budget of the House of Representatives, including budget preparation, submission and approval, disbursements, accounting, and financial operations. Jurisdiction: All matters relating to agrarian reform, the resettlement of and other support services for agrarian reform beneficiaries, and the implementation and amendment of the Comprehensive Agrarian Reform Law. Jurisdiction: All matters relating to food and agricultural production, agri-business, agricultural research and technology, soil survey and research, irrigation, farm credit and security, animal industry, and crop and livestock production. Jurisdiction: All matters relating to the expenditures of the national government including payment of public indebtedness, creation or abolition and classification of positions in government, and the determination of salaries, allowances and benefits of government personnel. Jurisdiction: All matters relating to aquaculture and fisheries production and development, aquaculture business, use of aquatic resources, freshwater and fisheries culture research and technology, and conservation of rivers, lakes and other fisheries resources. Jurisdiction: All matters relating to banking and currency, government-owned or controlled banks and financial institutions, non-government banks and financial institutions, insurance, and securities. Jurisdiction: All matters relating to pre-school, elementary and secondary education, science high schools (except the Philippine Science High School), teachers’ and students’ welfare, alternative learning systems and community adult education, the national language, libraries and museums, and the preservation and enrichment of Filipino culture. Jurisdiction: All matters relating to the organization, operation, management, rules and regulations of the civil service, the welfare and benefits of government officers and employees, and the regulation and practice of professions. Jurisdiction: All matters directly and principally relating to amendments or revisions of the constitution. Jurisdiction: All matters relating to cooperatives (consumer, producers, marketing, service, electric, and multi-purpose), urban- and rural-based credit, and the implementation or amendment of the Cooperative Code of the Philippines. Jurisdiction: All matters relating to illegal or prohibited drugs, its production, manufacture, use and trafficking, and the rehabilitation and treatment of drug dependents. Jurisdiction: All matters relating to ecosystem management, including pollution control. Jurisdiction: All matters relating to economic development planning and programs, inclusive of economic and socio-economic studies, and development policies and strategies. Jurisdiction: All matters relating to the exploration, development, utilization or conservation of energy resources, and entities involved in energy or power generation, transmission, distribution and supply. Jurisdiction: All matters relating to the duties, conduct, rights, privileges and immunities, dignity, integrity, and reputation of the House of Representatives and its members. Jurisdiction: All matters relating to the relations of the Philippines with other countries, diplomatic and consular services, the United Nations (UN) and its agencies, and other international organizations and agencies. Jurisdiction: All matters relating to all forms and places of gaming and amusements. Jurisdiction: All matters relating to malfeasance, misfeasance and nonfeasance by officers and employees of the government, inclusive of investigations of any matter of public interest on its own initiative or upon an order by the House of Representatives. Jurisdiction: All matters relating to the creation, organization, operation, reorganization, and amendments of charters of government-owned or controlled corporations (GOCCs) including the Government Service Insurance System (GSIS) and the Social Security System (SSS), but excluding government-owned or controlled banks and financial institutions. Jurisdiction: All matters relating to the reorganization of the government and its branches, departments and instrumentalities, and the creation, abolition or change of the principal functions or nature of any government department, agency, commission or board. Jurisdiction: All matters relating to public health and hygiene, and quarantine, medical, hospital and other health facilities and services. Jurisdiction: All matters relating to post-secondary and tertiary education, technical education, distance education, students’ and teachers’ welfare, and centers of excellence. Jurisdiction: All matters relating to shelter delivery, and the management of urbanization issues and concerns such as urban planning and development, urban land reform and welfare of the urban poor. Jurisdiction: All matters relating to the protection and enhancement of human rights, assistance to victims of human rights violations and their families, the prevention of violations of human rights, and the punishment of perpetrators of such violations. Jurisdiction: All matters relating to postal, telegraph, radio, broadcast, cable television, telephone, convergence, computers and telecommunications technologies, information systems inclusive of hardware, software and content applications, mobile short messaging system (SMS) applications, and networks that enable access to online technology. Jurisdiction: All matters relating to inter-parliamentary relations and linkages with international parliamentary organizations, establishment of inter-parliamentary friendship societies, and visits of parliamentary delegations as well as other foreign dignitaries. Jurisdiction: All matters relating to the administration of justice, the Judiciary, the practice of law and integration of the Bar, legal aid, penitentiaries, impeachment proceedings, registration of land titles, immigration, deportation, naturalization, and the definition of crimes and their penalties. Jurisdiction: All matters relating to labor, the advancement and protection of workers’ rights and welfare, employment and manpower development, labor standards, and the organization and development of the labor market including the recruitment, training and placement of manpower. Jurisdiction: All matters directly and principally relating to the grant, amendment, extension or revocation of franchises. Jurisdiction: All matters relating to autonomous regions, provinces, cities, municipalities, and barangays, including their revenues and expenditures. Jurisdiction: All matters relating to policies and programs to promote and enhance the development of the Metro Manila area. Jurisdiction: All matters relating to the development of Mindanao, including the preparation of a comprehensive and integrated development plan for Mindanao. Jurisdiction: All matters relating to Muslim affairs inclusive of the welfare of Muslim Filipinos, and the development of predominantly Muslim areas. Jurisdiction: All matters relating to national cultural communities, and the development of predominantly cultural community areas. Jurisdiction: All matters relating to national defense and national security, the Armed Forces of the Philippines (AFP), military bases, coast and geodetic surveys, and disaster relief and rescue. Jurisdiction: All matters relating to natural resources (except energy and fisheries resources) and their exploration, conservation, management and utilization, public domain lands, mines and minerals, forests, parks and wildlife, and marine resources. Jurisdiction: All matters relating to policies and programs on the promotion and protection of the rights and welfare of overseas Filipino workers (OFWs) and their families. Jurisdiction: All matters relating to the role, rights and responsibilities of people’s organizations, non-government and civic organizations, and other similar groups, and the establishment of mechanisms on people’s participation in governance and legislation. Jurisdiction: All matters relating to population growth and family planning, population census and statistics, family relations, and care of the elderly. Jurisdiction: All matters relating to policies and programs to address the poverty situation in the country and other actions to alleviate the plight of the poor, and promote their right to equal access to opportunities. Jurisdiction: All matters relating to the production and dissemination of information to the public through all forms of mass communications and media such as print and broadcast media, movie and television, video, advertising, cable television, and the internet. Jurisdiction: All matters relating to the suppression of criminality including those on illegal gambling, private armies, terrorism, organized crime and illegal drugs, regulation of firearms, firecrackers and pyrotechnics, civil defense, private security agencies, and the Philippine National Police (PNP). Jurisdiction: All matters relating to the planning, construction, maintenance, improvement and repair of public infrastructure inclusive of buildings, highways, bridges, roads, parks, drainage, flood control and water utilities. Jurisdiction: All matters relating to the revision and codification of laws. Jurisdiction: All matters relating to the rules of the House of Representatives, rules of procedure in impeachment proceedings, order of business, calendar of business, the referral of bills, resolutions, speeches, committee reports, messages, and the creation of committees. Jurisdiction: All matters relating to the development of rural areas and islands through policies, programs, and support services including livelihood and enterprise development, microfinancing, community mobilization and development, and access to rural projects funding and financing. Jurisdiction: All matters relating to science and technology including scientific and technological research and development, science and technology education including the Philippine Science High School System, intellectual property rights on biotechnology, and climate and weather forecasting. Jurisdiction: All matters relating to policies and programs on entrepreneurship development including the promotion of entrepreneurship, support to entrepreneurs, and the establishment and development of small and medium-scale enterprises (SMEs). Jurisdiction: All matters relating to the social development and welfare of persons with disabilities or special needs, including social services and interventions that enhance quality of life. Jurisdiction: All matters relating to the protection and advancement of the right of suffrage, and the conduct of elections, plebiscites, initiatives, recalls and referenda. Jurisdiction: All matters relating to the development and promotion of tourism and the tourist industry, both domestic and international. Jurisdiction: All matters relating to domestic and foreign trade, intellectual property rights, patents, standards, weights and measures, quality control, consumer protection, prices of commodities, handicrafts and cottage industries, and the development, regulation and diversification of industry and investments. Jurisdiction: All matters relating to land, sea, and air transportation, the establishment, operation, management and regulation of airports, seaports and other mass transportation systems including rail systems and roll on-roll off (RO-RO) systems, civil aviation, air transport agreements, transportation safety standards, air transport security, and maritime security. Jurisdiction: All matters relating to the welfare of war veterans, veterans of military campaigns, military retirees, and their surviving spouses and beneficiaries. Jurisdiction: All matters relating to the fiscal, monetary and financial affairs of the national government, including tariff, taxation, revenues, borrowing, and credit and bonded indebtedness. Jurisdiction: All matters relating to the needs, education and overall welfare of Filipino children. Jurisdiction: All matters relating to the rights and welfare of women and female children and youth, inclusive of their education, employment and working conditions, and concerns relating to gender equality. Jurisdiction: All matters relating to youth development, including the development of their leadership potentials and the promotion of their moral, physical, intellectual and social well-being, and sports development. Jurisdiction: All matters relating to policies and programs relating to bases conversion, the operation of special economic zones in former military bases, sale of military camps, relocation of military camps and personnel, and the construction of new military camps. Jurisdiction: All matters relating to policies and programs to promote the development of the Bicol region, inclusive of developmental projects, care programs and the Bicol River basin project. Jurisdiction: All matters relating to social, political, economic policies affecting the countries within the area, and the promotion of trade and investment among these countries. Jurisdiction: All matters relating to programs and policies relating to food production and distribution, sustained growth and self-reliance in the production of basic food commodities, the availability of these commodities to the people, and long-term food security for the nation. Jurisdiction: All matters relating to the effects on various social sectors of World Trade Organization (WTO) policies, and other actions to harness opportunities offered by globalization for development. Jurisdiction: All matters relating to land use issues inclusive of the enhancement of resource use and management of indigenous cultural communities, preservation of historical and cultural heritage sites, and linkages among agencies and stakeholders in land resource management. Jurisdiction: All matters relating to the achievement of the country’s commitment to the Millennium Development Goals (MDGs) by 2015. Jurisdiction: All matters relating to all policies and programs concerning the development of municipalities, cities, provinces, and other local communities in the northwest Luzon area. Jurisdiction: All matters relating to negotiations and other initiatives in pursuit of the peace process and national reconciliation, the cessation of hostilities generated by internal armed conflicts, and the welfare of rebel-returnees. Jurisdiction: All matters relating to policies and programs on reforestation, and other actions to ensure the implementation of a sustained community-based nationwide reforestation program. Jurisdiction: All matters relating to the development of the Southern Tagalog area, inclusive agricultural areas, tourism, economic, and industrial estates and processing areas therein. Prior to the creation of a legislature in the Philippines, Filipinos, from time to time, were allowed to sit in the Spanish Cortes as representatives of the Philippine Islands. In 1810, the Spanish government allowed Filipinos to receive Spanish citizenship and appropriate representation in the Cortes. When the Cadiz Constitution was in full force and effect, Filipino representation became a standard in the Cortes. However, in 1837, the liberal Cortes finally abolished representation and declared that overseas territories of Spain to be ruled by special laws. This loss of representation was one of the main points that Jose Rizal and other propagandists were fighting for during the Propaganda movement. The first Filipino legislature was convened on September 15, 1898 in Barasoain Church, Malolos, Bulacan. Later known as the Malolos Republic, it drafted the first constitution of the Philippines, which was also the first democratic constitution in Asia. The Congress included delegates from different provinces of the Philippines, some elected and some appointed. It was a short-lived legislature, unable to pass any laws due to the onset of the Philippine-American War. The first Philippine Republic was ended on March 23, 1901 with the capture of President Emilio Aguinaldo in Palanan, Isabela. In 1899, United States President William McKinley appointed a commission led by Dr. Jacob Schurman to study and investigate the conditions in the Philippine Islands. This would be known as the first Philippine Commission. It was followed by another investigative commission led by William Howard Taft in 1900, which also had limited legislative and executive powers. From 1901 onwards, the Philippine Commission would be regularized. It exercised both executive and legislative powers, with three Filipino delegates, namely Benito Legarda, Trinidad Pardo de Tavera, Jose Luzuriaga. After the organization of the Philippine Assembly (see below) in 1907, the commission stayed on as the upper house of the legislature. Electoral representation in the Philippines by Filipinos began when the American insular government allowed partial self-governance by establishing the Philippine Assembly. The assembly, as the lower house, shared legislative power with the Philippine Commission, which remained under American control, as membership in the Philippine Commission was still restricted to appointed American officials. In 1907, still under American rule, the Philippines held its first national elections for the newly created representative body, which had an inaugural membership of 81 Filipinos representing their respective districts. In the succeeding years, the number of districts were increased to 85 in 1910, and 91 in 1912. Upon the enactment of the Jones Law in 1916, the Filipinos were subsequently granted the opportunity to hold other offices in the government. Positions in the Philippine Senate were opened to Filipinos, with 12 senatorial districts and two senators elected from each. The inaugural President of the Senate in 1916 was Manuel L. Quezon, representing the fifth senatorial district. He would hold this position until the establishment of the Commonwealth of the Philippines in 1935. For the 19 years prior to the Commonwealth, the Senate presidency was the highest position a Filipino could hold. From the first Philippine Commission to the establishment of the Commonwealth of the Philippines, the Philippine legislature were passing public acts. This form of legislation is started at Congress, with the approval of the American governor-general of the Philippine Islands. On November 15, 1935, Quezon took his oath as the first President of the Commonwealth of the Philippines, giving control of the executive branch of government to the Filipinos. It was also in this era that the Supreme Court of the Philippines was completely Filipinized. By virtue of the 1935 Constitution, the bicameral Philippine legislature was merged to form the unicameral National Assembly. Two elections were held under the Commonwealth. The first, in 1935, elected the President of the Philippines as well as members of the National Assembly; the second, in 1939, elected only members of the National Assembly. The National Assembly would be retained until 1941, when a new structure for the legislature was introduced through a constitutional amendment. From the Commonwealth period to the inauguration of the Third Philippine Republic, the Philippine legislature was passing Commonwealth acts (CA). This form of legislation is started at the National Assembly and approved by the President of the Philippines. After six years under a unicameral legislature, the Constitution of 1935 was amended, dividing the National Assembly into two separate houses. The Senate of the Philippines and the House of Representatives were reestablished, with a Senate President and a Speaker of the House leading their respective chambers. The elections for members of these newly created chambers were held in 1941. However, the onset of World War II prevented the elected members from assuming their posts and the legislature of the Commonwealth of the Philippines was dissolved upon the exile of the government of the Philippines. On October 14, 1943, the Japanese-sponsored Second Republic was inaugurated, with Jose. P. Laurel as the President. This government followed the newly crafted 1943 Constitution, and reverted the legislature back to a unicameral National Assembly. The National Assembly of the Second Republic would remain in existence until the arrival of the Allied forces in 1944, which liberated the Philippines from the Imperial Japanese forces. Upon the reestablishment of the Commonwealth in 1945, President Sergio Osmeña called for a special session of Congress. The first Congress convened on June 9 of that year, with most of the senators and representatives, who were elected in 1941, assuming their positions. Manuel Roxas and Jose C. Zulueta served as Senate President and Speaker of the House, respectively. Not all, however, were allowed to take their post because some were incarcerated for collaboration with the Japanese. The inaugural session, was held in a converted school house in Lepanto St., Manila, as the Legislative Building in Manila was reduced to ruins as an outcome of the war. On April 23, 1946, national elections were held to choose new members of Congress, the President, and the Vice President of the Philippines. After the elections the second Congress of the Commonwealth convened on May 25, 1946. It would only last until July 4, 1946, with the inauguration of the Third Republic of the Philippines. The independent Republic of the Philippines was finally proclaimed on July 4, 1946 with Manuel Roxas as President. The Second Congress of the Commonwealth was transformed into the first Congress of the Republic of the Philippines, also made up of the Senate and the House of Representatives. This would mark the beginning of the count of Congresses of the Republic until the imposition of Martial Law in 1972, when Congress would be dissolved. This era started the legislation of republic acts which would continue until 1972. Upon the restoration of democracy in 1986 and the ratification of the 1987 Constitution, the naming of laws as republic acts would be reinstated. On September 23, 1972 President Ferdinand E. Marcos issued Presidential Proclamation No. 1081, placing the entire country under Martial Law. This coincided with the closing of the sessions of both chambers of Congress. Days before the scheduled reopening of the Senate and the House of Representatives, Marcos promulgated the 1973 Constitution, which effectively abolished the bicameral legislature and replaced it with a unicameral legislature. Opposition legislators reported to the Legislative Building on January 22, 1973, but found the building padlocked and under an armed guard. Under martial rule, Marcos created the Batasang Bayan in 1976, by virtue of Presidential Decree No. 995, to serve as a legislative advisory council—a quasi-legislative machinery to normalize the legislative process for the eventual actualization of the 1973 Constitution. The Batasang Bayan would hold office in the Philippine International Convention Center (a modernist structure designed by National Artist for Architecture Leandro Locsin, within the Cultural Center of the Philippines Complex—a pet project of First Lady Imelda R. Marcos). The consultative body would serve until 1978. The Batasang Bayan would be replaced in 1978 by an elected unicameral body: the Interim Batasang Pambansa (IBP), a parliamentary legislature, as provided for in the 1973 Constitution. On April 7, 1978, elections for were held. Those elected to the IBP would be called Mambabatas Pambansa (Assemblymen) who would be elected per region, via a bloc-voting system. The IBP opened on Independence Day 1984 in the Batasan Pambansa in Quezon City. Members of the Regular Batasang Pambansa (RBP) were elected in 1984, this time at-large and per province. The RBP held its inaugural session on July 23, 1984. In 1986, President Marcos succumbed to international pressure and called for a snap presidential election. Though Marcos and his running mate former Senator and Assemblyman Arturo Tolentino were proclaimed by the Batasang Pambansa as the winners of the election, a popular revolt installed opposition leaders Corazon C. Aquino and Salvador H. Laurel as President and Vice President, respectively. For both the IBP and RBP, the laws passed would be called “Batas Pambansa,” which did not continue the previous numbering of Republic Acts. On March 25, 1986, President Aquino declared a revolutionary government by virtue of Presidential Proclamation No. 3, s. 1986, which suspended some provisions of the 1973 Constitution and promulgated in its stead a transitory constitution. This effectively abolished the Batasang Pambansa. A constitutional commission, tasked with drafting a new charter, was created by virtue of Proclamation No. 9 issued on April 23, 1986. Following the overwhelming ratification of the 1987 Constitution through a national plebiscite held on February 2, 1987, the 1987 Constitution finally came into full force and effect on February 11, 1987. It re-established a bicameral legislature, composed of the House of Representatives and the Senate, much like the way it was before martial law. The former, being much larger in composition, reopened in the Batasan Pambansa while the Senate, still with its 24 members, returned to the Legislative Building. 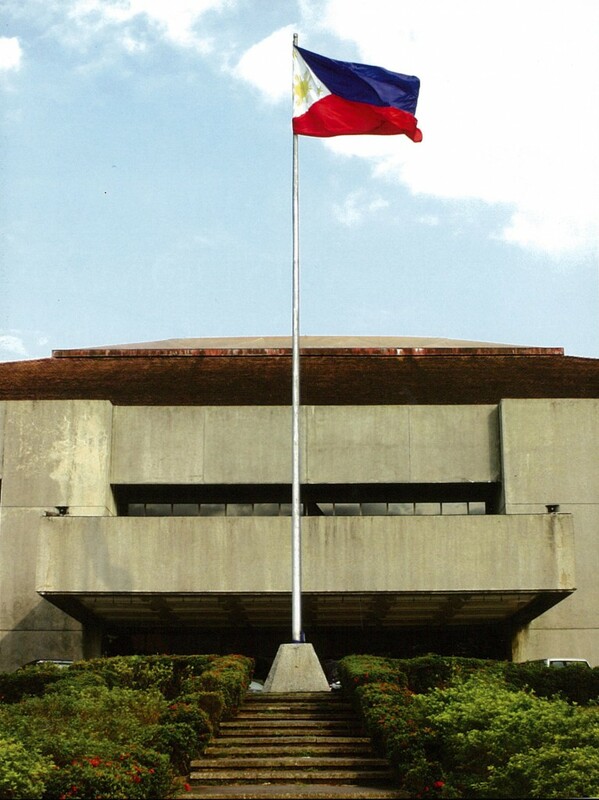 In 1997, the Senate of the Philippines moved to the GSIS building where it is currently housed. Laws passed by the bicameral legislature would restore “Republic Acts”, as the laws were named in the Third Republic (1946-1972). Moreover, it was decided to maintain the old count, taking up where the last pre-martial law Congress left off. Thus, the last Congress under the 1935 Constitution was the seventh Congress, and the first Congress under the 1987 Constitution became the eighth Congress. The constitutional provisions for the legislature are written in Article VI of the 1987 Constitution.